Whale Watchers Properties brings you this superior luxury apartment on the Muizenberg beachfront. Perfectly positioned right above Surfer’s Corner in the Empire building, this tastefully decorated 2-bedroom apartment features original artworks, luxurious leather couches and panoramic views from a large balcony. Wake up to a sunrise one the False Bay coastline in this spectacular apartment. This lovely 2 bedroom fully equip sea-facing unit is situated on the 1st floor in the safe and secure Empire Building on Muizenberg Beachfront. 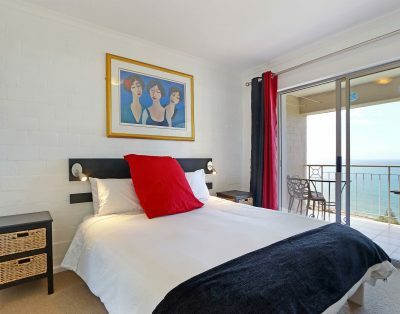 The apartment consists of two bedrooms of which one has sea views and a queen bed and another with two single beds. The apartment has two bathrooms with towel warmers, the one being en-suite. 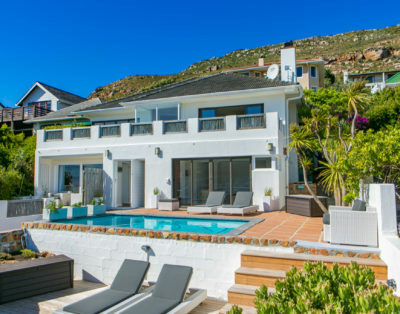 There is a fully equipped kitchen with a dishwasher and washing machine, an open-plan living area with DSTV and Free WiFi and a sleeper couch for up to two children (surcharge applies). This apartment is well suited for a family of 4, but can easily accommodate up to 6 people.